An Investor Relations Officer (IRO) resides, uniquely, as the nexus between senior management and the outside world. Maintaining and nurturing the dialogue between the company and the capital markets, including current and potential shareholders and financial analysts, is at the core of the IRO’s responsibility. Like any conversation, it is a two-way street with the IRO articulating their company’s key messages, milestones and accomplishments while carrying back the financial market’s views about the company. This dialogue extends beyond an IRO’s individual company to encompass its industry competitors. Call it competitive intelligence, market intelligence, media monitoring or something else, a successful intelligence gathering function shares a few common characteristics that translate into effectiveness, efficiency and strategic importance. This white paper explores the evolving role of IR in competitive intelligence and how some industry thought leaders across Canada are taking it on as part of the IR mandate. IROs’ competitive information gathering typically starts with comparative valuation data and stock performance, as well as commentary on industry, product and market trends and performance. Because IROs are situated in a daily environment where information of all types can flow broadly and rapidly across multiple channels they have the opportunity to make unique contributions to competitive-intelligence gathering within the organization. IR sits very much in the flow of strategically important information, ranging from financial performance and competitive positioning of peers to industry trends and the value investors are willing to place on different management strategies and actions. Sometimes, this information is available nowhere else. While this intelligence-gathering role has been carried out informally by IROs in the past, the responsibility is increasingly becoming a formal part of the IRO’s job description. A recent survey of IROs by the Canadian Investor Relations Institute (CIRI) found this aspect of the role has grown to be a recognized part of the IR team’s mandate, with 95 percent of IROs reporting that they regularly gather information on their company’s market competitors. 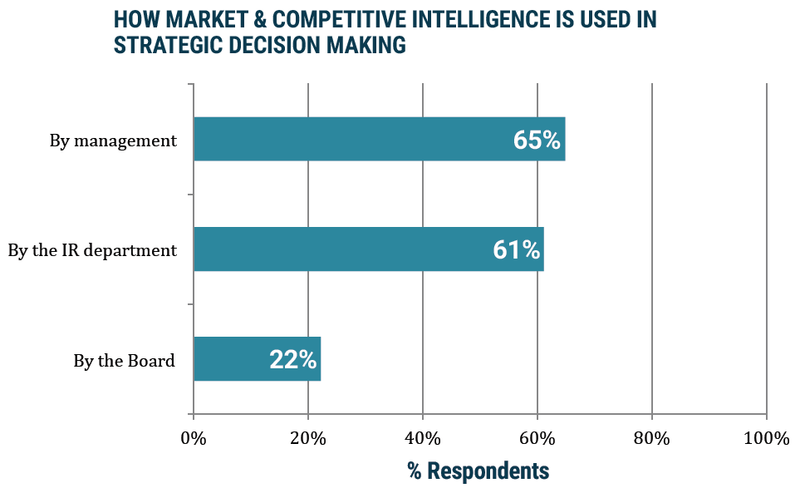 Nearly two thirds of IROs report that their intelligence-gathering effort feeds senior management’s strategic discussions and decision-making, while 61 percent say it informs IR strategy and 22 percent regularly provide competitive intelligence to board members. 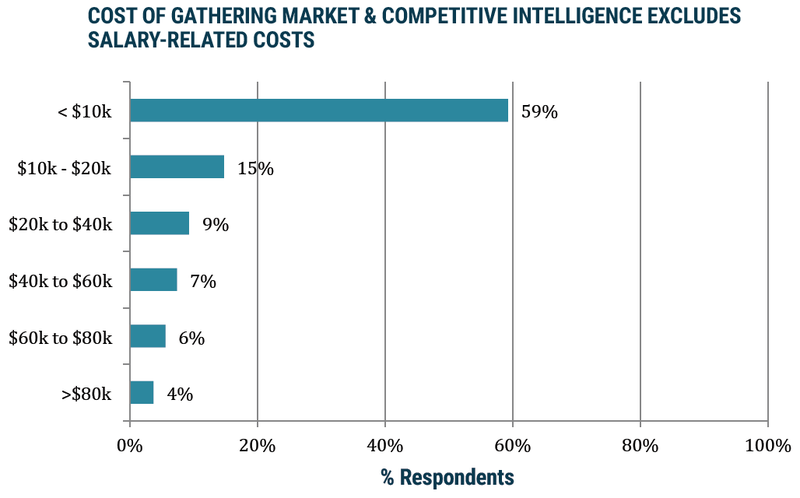 CIRI also found that 59 percent spend less than C$10,000 in gathering and analyzing market competitive intelligence. That level of spending points less to the use of outside consultants and more to an in-house approach that also uses tools – from external databases to monitoring services – that cut down on the IR team’s time commitment to gather, evaluate and pass along what is relevant from this stream of information. Here 83 percent of IROs report that competitive-intelligence gathering requires less than 25 percent of one in-house, full-time employee’s time. competitors’ investor conference presentations. Here IROs are uniquely positioned, able to sit in the audience and not just hear management’s presentation but also investors’ questions and discussion. While this intelligence-gathering role is an important part of the IRO’s portfolio, executing it well requires a thoughtful and deliberate approach. As distribution of news, opinion, data and analytics has moved online, the flow of information is seemingly more easily accessible than ever, but keeping on top of what’s relevant and shutting out the noise has never been more challenging ‒ nor more urgent. management with a daily deluge of undifferentiated data, applying internal expertise adds context and insight, turning information into intelligence. For IR departments specifically, success in competitive intelligence is defined by the value of the information it provides to internal audiences. Whether on tactical or strategic issues, the IR team should aim to influence corporate decision-making through the unique information and insight it can deliver. IR teams that pull this off can expect their status to rise within corporations by acting as a trusted adviser to other departments and the C-suite. Greg Secord, vice president of investor relations at Ontario-based software company OpenText Corp, takes a collaborative approach to competitive intelligence that extends the company’s reach and understanding and keeps him on top of trends he might not otherwise be aware of when talking with analysts and investors. Each department needs to share the information and more importantly, what it means to the business. For example, Secord sits in on all conversations with technology industry analysts such as Gartner Group and International Data (IDC), which track the software industry on behalf of vendors and end-users with the same thoroughness and energy that analysts track companies for investors. Having this level of insight helps inform Secord’s dialogue with investors at a much higher level, he says. In addition, collaboration is reinforced by physical proximity, as IR sits right next to the corporate development team so they are continually sharing ideas and information, each informing the other of its particular view of the competitive landscape. Sharing information collaboratively benefits other parts of the organization and can also strengthen the IR effort. For example, while Secord’s team focuses on financial media and analysts, the marketing team provides a steady stream of input on sources it is more familiar with, including trade press and social media. While monitoring social media such as Twitter or Facebook ranks as low priority with some IR teams, they ignore it at their peril. We can look no further than its importance in marketing and crisis management to see its impact. This is where OpenText’s collaborative model constitutes a smart approach in alerting the company to risks it might otherwise miss. Estelle Métayer, principal and founder of competitive and strategic intelligence firm Competia, thinks IROs ignoring social media may be inadvertently creating vulnerabilities. Digitally savvy directors will be monitoring it themselves and expecting the company to be on top of social media chatter. Métayer says that insight could be useful, especially in preparing for the annual shareholder meeting, where a social media discussion might provide an early warning on hot-button topics that otherwise might catch management by surprise. She said that when monitoring shareholder sentiment, Twitter has been useful and Facebook is growing in value rapidly. In a 24/7 news-saturated environment where ‘noise’ can drown out what is important, efficiency comes from being selective and disciplined about which sources of information are fed into the effort, as well as what rises to significance that merits landing on senior management’s radar. In addition, an efficient competitive-intelligence effort is aware of the timing of increasing surveillance in response to market and company-specific developments. Kristen Dickson, vice president at National Equicom and group leader of its technology and financial services IR consultancy, says being timely and tuned in when it matters most is as important as knowing what to pay attention to. She deploys a media monitoring tool from CNW, a Cision company, that is particularly important when clients undergo important transitions, such as M&A transactions. 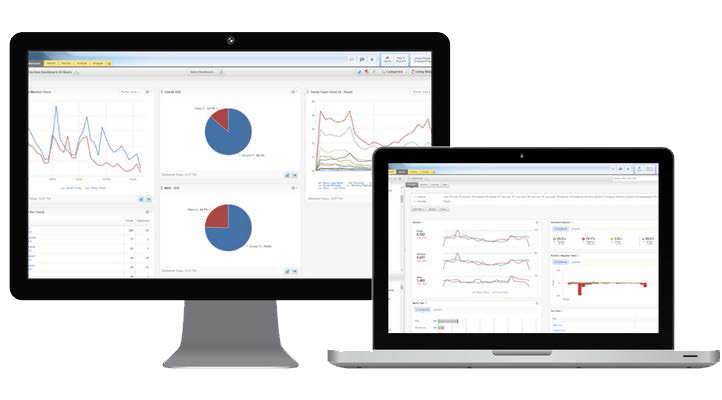 By tracking company, competitor and industry mentions to stay on top of what’s trending when a client is in the middle of a transaction or a crisis, Dickson can ensure the company’s messages are resonating. In addition, vigilant monitoring helps her team members track conflicting messages that may be part of the overall news and opinion flow, so they can decide what counter-messages need to be raised. While selectivity is important, it needs to be applied thoughtfully, Dickson argues, cautioning that it would be irresponsible not to consider all sources of information that potentially will reach the investment community. It would be naïve to assume institutional investors don’t read general news media, but the key to efficiently monitoring the deluge of information is to understand who each outlet’s target audience is. For time-stressed IROs with limited staff resources and multiple demands, the need to focus an intelligence-gathering function is imperative. Greg Waller, vice president of IR and strategic analysis at Vancouver-based mining conglomerate Teck Resources, describes how he aligns his efforts with what is most important and ignores the rest. While the marketing and sales departments keep a close watch on demand for the company’s metals and mining output, Waller focuses his attention on any intelligence about the investments Teck’s competitors are making to increase their own capacity. This information is vital to a resources company, Waller explains, because understanding competitors’ investment intentions can drive the timing of investment decisions within his own company. Waller views it as a part of every senior manager’s job to stay, in any department, informed of vital competitive information. Each part of the organization plays a role in assessing and passing along information, whether it’s the corporate development group looking for acquisition candidates, marketing that is tracking demand drivers, or a dedicated internal library that tracks industry data. While he does not pass along every analyst note that crosses his desk, the expectation that important information will be shared across the company means senior management trusts him when he shares an analyst’s report and suggests that it’s something his management team should pay attention to. Strategic impact derives from aligning the intelligence-gathering effort with the company’s most important initiatives, opportunities and challenges, from corporate development priorities and product strategies to competitive positioning and financial performance. Competitive information is used to inform disclosure practice and policy, says Yvette Lokker, CEO of CIRI. 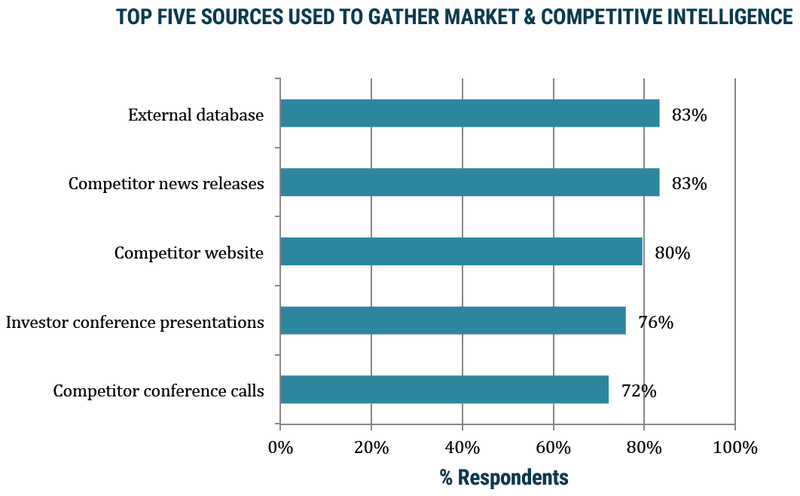 For example, if competitors’ disclosures vary widely either in scope or content, that gap becomes a topic for disclosure committee deliberations. In addition, if competitors were talking about different drivers in the marketplace, she would look at that and see how it might affect messaging in clients’ quarterly earnings announcements. Strategic impact is why OpenText’s Secord argues IR is the natural home for competitive intelligence. Within his four-person group, he has one analyst responsible for monitoring the news stream across the Bloomberg terminal on behalf of the entire company. Because this responsibility resides within IR, his group can do more than just distribute data. By continuously monitoring what competitors are telling investors and how the financial markets perceive competitive positioning across the industry, his group is in a unique position to add strategic context. “We are so tied in to corporate strategy, we can identify if something changes that may be close to our strategy or may be completely different,” he says. While it may be a subtle difference, Secord argues that the ability to add context is important at the highest level. “That’s how you take the noise out,” he explained. There is an additional dimension to competitive-intelligence gathering that goes right to the heart of how the IRO’s role is perceived by the investment community. When the conversation moves beyond your own company performance, Secord says, investors look to IR as the subject level experts within their industry, able to discuss competitive differentiators among all their peers, market trends and disruptors. This enhanced role elevates the conversation to a strategic level and brings really great value to IR in his opinion. As the pace of change across virtually every industry continues at an unprecedented rate, the need to make sense of developments and gain perspective on what’s next has never been more important. Investor relations, positioned among the most strategically important flows of information, has a unique opportunity to play this important role by focusing competitive-intelligence gathering with an eye to its effectiveness, efficiency and strategic impact.